Today you are one step closer to a new you – centered, empowered and on a positive path to the rest of your life. There are times in our lives when we need help recognizing and understanding what life is trying to tell us. When we are faced with conflicts that create stress and anxiety, or when life just makes us feel like we are losing our minds. Working through these challenges, though incredibly difficult, help us to grow, become stronger and more self-confident. With respect and compassion, together we can explore the complex issues that are creating pain in your life and keeping you from becoming the real you. As a therapist, my goal is to help you uncover your true potential and lead a life that is worth celebrating. 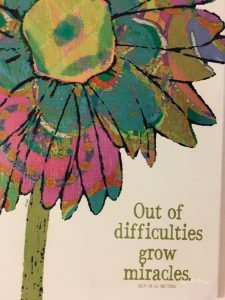 While we can’t change difficult situations of the past, we can work together to better understand them and use the challenges and traumas that you have experienced to create a new way of seeing. By applying complementary therapy approaches and techniques, we will unearth long-standing behavior patterns or negative perceptions that may be holding you back from experiencing a more fulfilling and meaningful life. If you’re ready to be your true self, I look forward to helping you meet your goals and achieve your dreams.